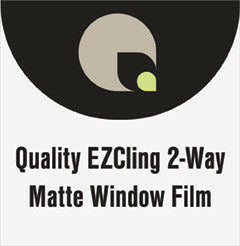 Quality EZCling 2-way Matte is a 4.0-mil PET clear film for smooth surfaces that is repositionable and removable and does not leave an adhesive residue on the surface. Translucent film allows message to be seen from inside or outside of glass. Film can be backlit at night and show vibrant colors in direct sunlight. No adhesive residue remains after graphics is removed from glass surface. This includes long-term applications. Durable, does not require lamination. Dries fast and does not stretch or curl. Can be reverse printed for interior mount applications. Ideal for window graphics, backlit display and decorative glass displays. Compatible with UV curable and latex printers.